Traveling There: Flights connecting Los Angeles to Nadi, Fiji (pronounced "Nahndy") are available through United Airlines, Air Pacific, Qantas Airways, and Air New Zealand,. Web links and phone numbers are available at this magazines Airlines page. Flight times average about 12 hours. Flights generally leave Los Angeles in the evening and arrive in Fiji in the early morning, with a day "lost" due to the International Date Line. Flights from Fiji generally leave in the evening and arrive in the early afternoon (on the same date, due to the day "regained" due to the Date Line). Note that Fiji has a five-hour earlier time difference from Los Angeles. Travelers from the United States can make same-day connections to Taveuni and other islands. Sun Air provides flights twice daily from Nadi to Taveuni. Maravu Resort provides a convenient van pickup from the airport, a short five-minute drive to the resort. Visitors to Fiji will find that it is generally not necessary to rent a car, as local transportation arranged through their resort accommodations or via taxi is convenient. Staying There: Taveuni and Maravu Resort deserve at least a seven-day or longer stay. With such a long travel distance, traveler's from the United States and Canada may well consider visits to additional Fiji locations. Recommended locations are the Yasawa and Mananuca island chains of northwest Fiji. Options include small island resorts and multi-day island cruises. The web links and guide book (below) are useful for itinerary planning. Our recommended guide book is Frommer's South Pacific. It provides four chapters of useful information for lodging, dining, beaches, activities, and sites on Taveuni and other islands of Fiji. It also covers Tahiti and French Polynesia, Samoa, the Cook Islands, and Tonga. A recommended travel bureau for developing trip arrangements is South Pacific Holidays, specializing in Fiji vacations. Fast Facts: Fiji has less than 800,000 inhabits, the majority of whom live on Viti Levu, the largest island, with over half of Fiji's 7,150 square miles. Fiji's population is 52% Fijian and 48% Indian. 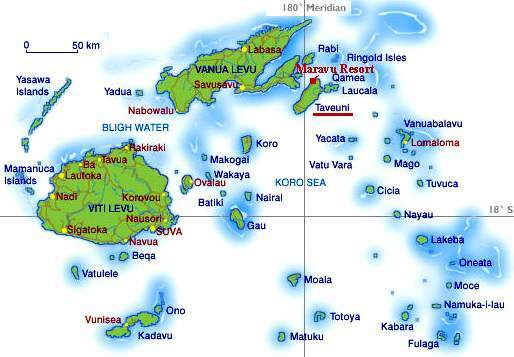 The population of Taveuni (13,000) and the smaller islands is almost entirely Fijian. English is the official language, and it is utilized in Fiji's schooling system. Various Fijian dialects are spoken by the indigenous Fijians. With 300 islands, Fiji hosts approximately 300,000 visitors per year. By contrast, Hawaii, with 8 islands and less land area, hosts 7,000,000 tourists each year. Travelers to Fiji seek the enjoyment of its native South Pacific culture and its pristine reefs, rivers, and forests. A recommended time to travel to Fiji is during their "winter" season, June to October, although as a South Pacific locale the shoulder months of April, May, and November are also pleasant. Indigenous Fijians have managed to hold onto their traditional rites and practices such as Mekes (narrative dances), bure construction, kava ceremonies, tapa-cloth making and pottery. Note that according to Fijian traditions, village visitors should not "drop in." Visitors should be invited before entering a Fijian villlage. The Meke celebration embraces traditional song and dance to represent the legends of Fiji. Dance varies from a blood-curdling spear dance to a graceful fan dance. The Meke orchestra sits on the ground, playing instruments and singing, while the dancers perform. The men dancers dress in full warrior costume and the women in traditional wear. Kava or "yaqona" is Fiji's national drink. Kava is made from a certain pepper root, pulverized into a powder and mixed with water to form a cloudy substance which has medicinal and somewhat sedative qualities. It's preparation and drink in a formal ceremony is very structured according to the ranking of the individuals. In a social atmosphere, kava drinking is a great unifier, and discussion around the kava bowl can cover a wide range of topics, similar to "pub chatter." Return to Taveuni -- A Fijian Paradise article.